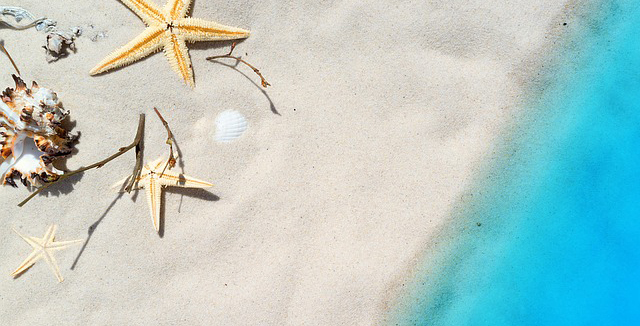 When we started our trip we had no intention to visit Puebla, Mexico, but we ended up spending less time on the Pacific coast than planned so we had a week to fill in our itinerary. We selected Puebla because it was on our route from Oaxaca to Taxco, our later destination, and because it looked like there were some interesting things to do there. 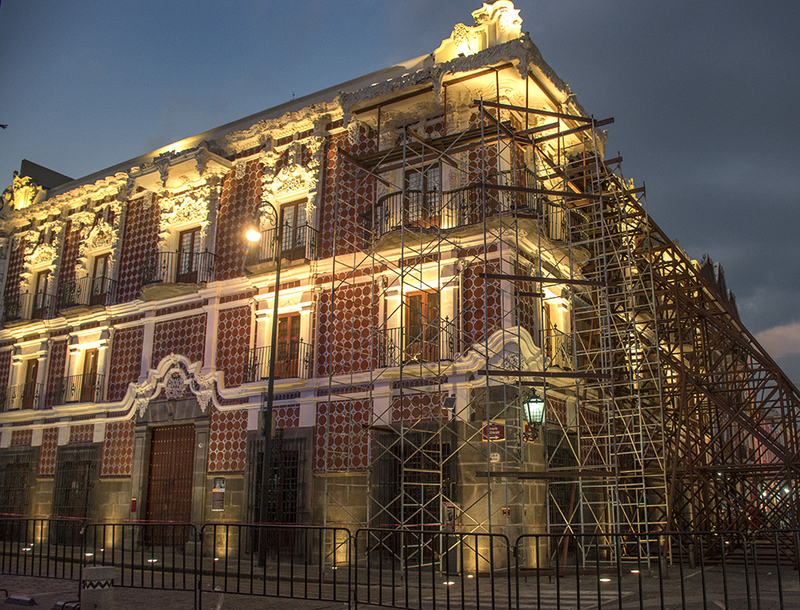 In hindsight, we are really happy we chose Puebla, because it is a wonderful town. We took a comfortable ADO first class bus from Oaxaca and arrived at the huge CAPU bus terminal in Puebla about 5 hours later. There we had our first experience arranging a “secure” taxi. In large cities in Mexico these are recommended because of the (probably small but unfortunately real) risk of encountering a taxi driver in cahoots with thieves, but it also has a side benefit of locking your taxi fare in at a fixed amount. The process is simple. You go to the secure taxi window located inside the terminal and tell the person there where you want to go. They calculated the fare and you pay it in advance. You are given a ticket with a number for the driver\taxi that has been assigned to you. You go outside and find the taxi (or give the ticket to a dispatcher outside who finds it for you) and your driver takes you to your destination. It’s a bit like Uber because the driver doesn’t deal with the money. Barrio del Artista with a long row of artist’s studios. Each door is one artist. 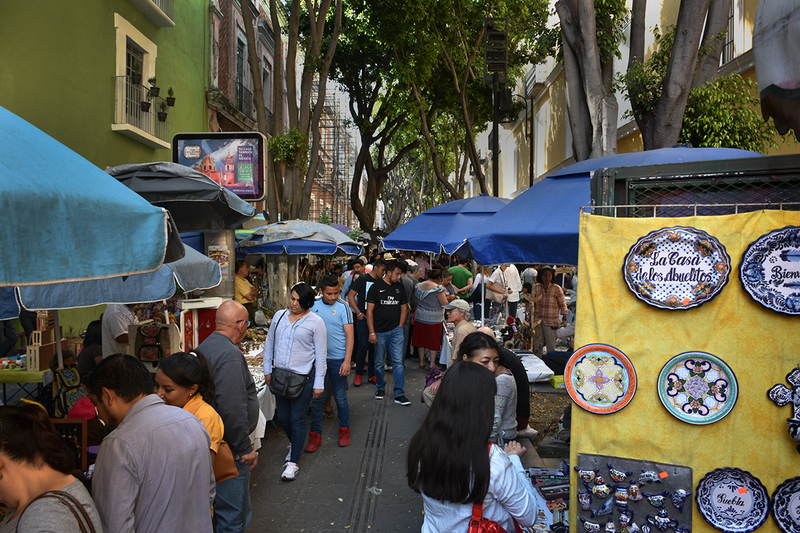 Our AirBnB was chosen because it was located right next to the Barrio del Artista, a neighborhood with one street lined with artist studios, and the Mercado el Parian, an artesans market, as well as being only 4 blocks from the Zócalo. 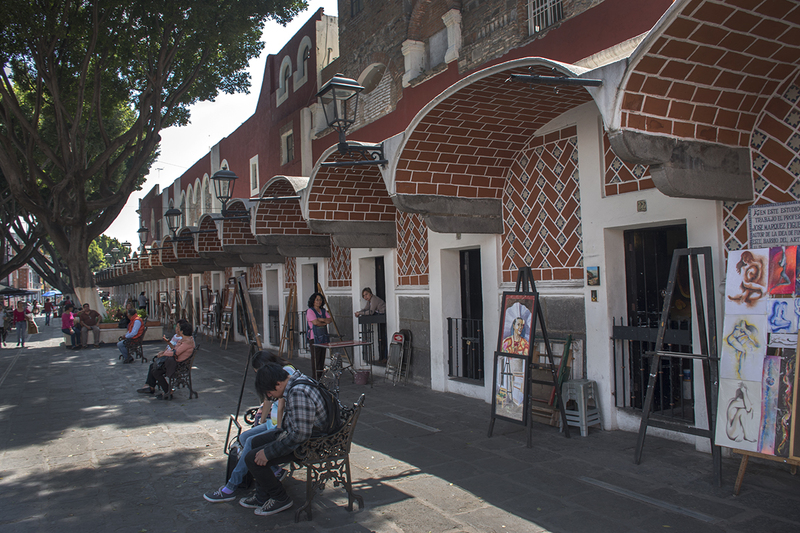 This entire area of Puebla is very picturesque and ideal for walking around, with lots of restaurants, bars, and shops. 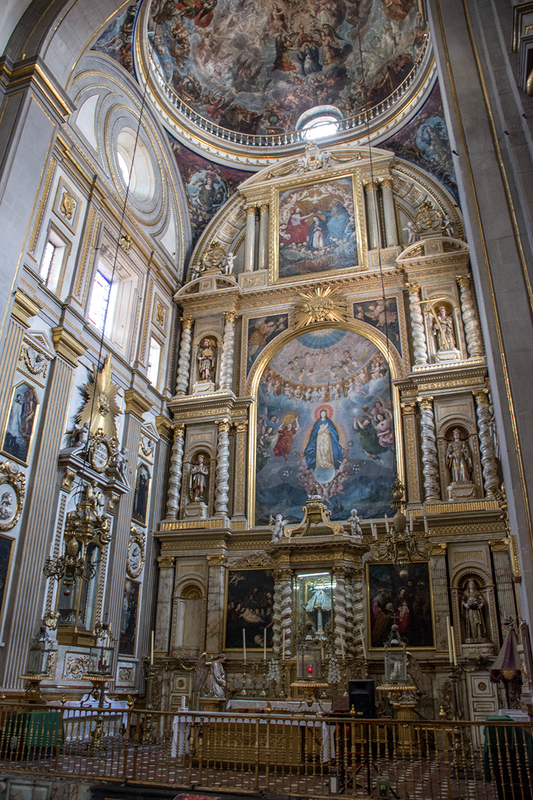 We took one day trip to the archeological site in Cholula during our stay, but for the most part our days consisted of walking around the centro for hours every day, visiting shops, museums, and, of course, more churches. Sunday outdoor market on one of several pedestrian-only streets near our AirBnB. 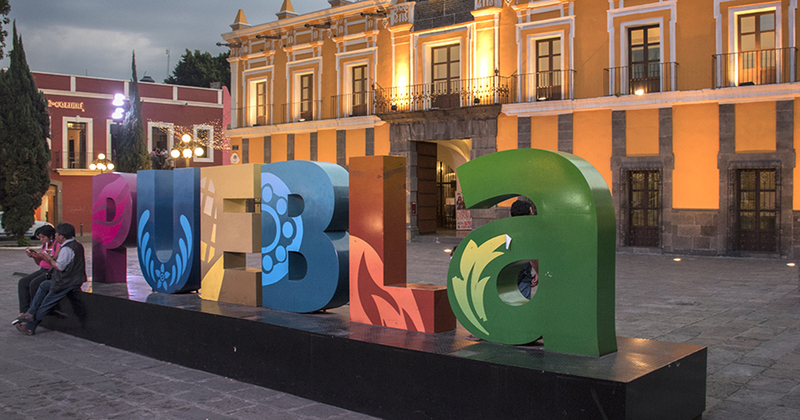 Puebla is the fourth largest city in Mexico, with a population about the same as Seattle, but it doesn’t feel that big. 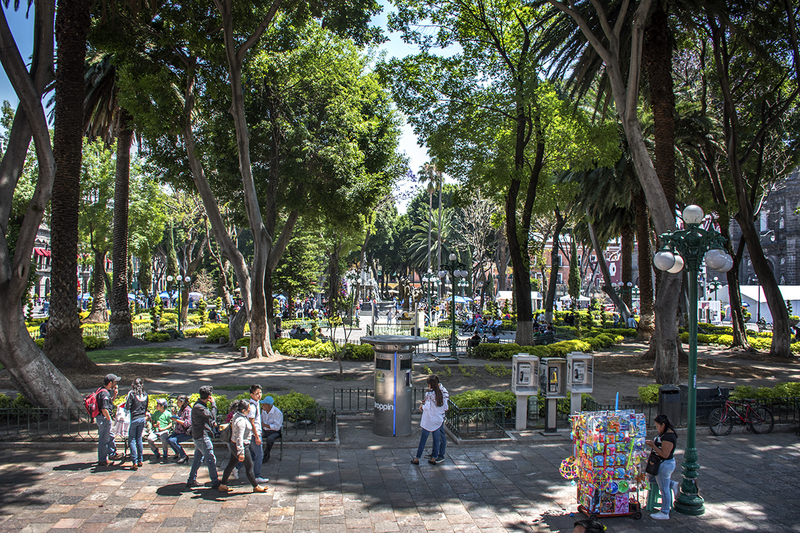 Within a 10 block radius around the zócalo, where we explored the most, the city is clean and there are several beautiful tree filled streets restricted to pedestrian traffic only. We noticed several immediate differences from Oaxaca: no indigenous people in native clothing, no tlayudas, almost no mezcal shops. There were still chocolate and mole shops, because Puebla is the other city, besides Oaxaca, claiming to be the mole capital of Mexico. There were more restaurants selling hamburgers and french fries, pizza, and foods you would find in the U.S. In Oaxaca the sandwiches available were “tortas”, but in Puebla they are mainly “cemitas” and every cemita I ate in Puebla was better than any torta I had eaten in Oaxaca. Sorry Oaxaca. On Sunday, the pedestrian-only streets were filled with open air markets and many people were out shopping and in the restaurants. Everywhere else we’d been in Mexico, Sunday was a dead day with hardly any shops or restaurants open, and fewer cars and people out. 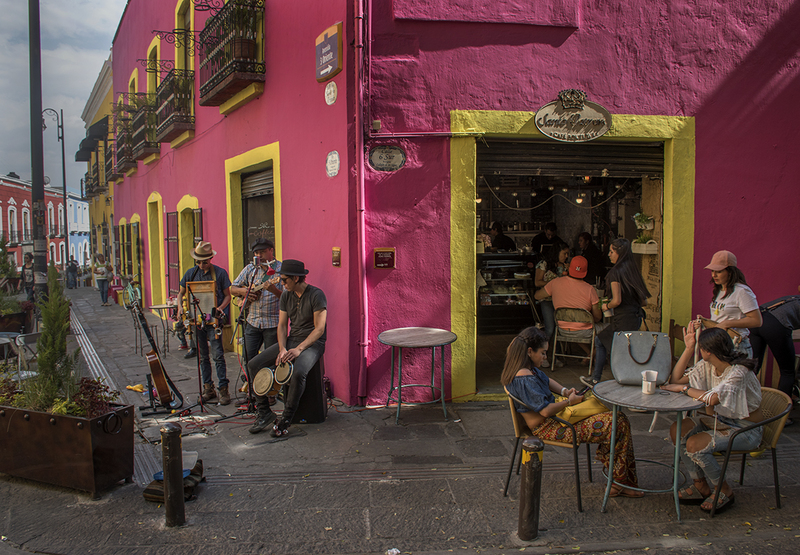 Street musicians at a cafe near our AirBnB. The zócalo in Puebla is very large and well tended, less homey feeling and with fewer people hanging out than the zócalo in Oaxaca, and also without the permanent tent encampments of locals protesting the government. We were told by a tour guide that Puebla is the only city in Mexico which was designed from the beginning to be a Spanish city and that it was originally inhabited only by people of Spanish descent. She said that Poblanos (people from Puebla) have a reputation for being standoffish and distrustful, probably because of their elitist history. We didn’t notice the standoffishness in our interactions with people in the town. 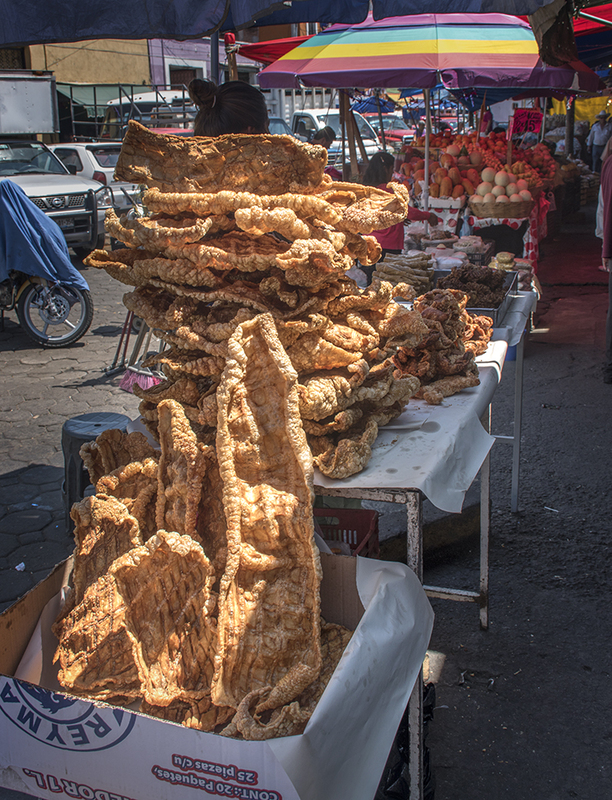 Chicharron stand outside one of the mercados in Puebla. In the immediate area where we were staying there were no shops selling fresh fruit or vegetables and also very few street vendors. We thought this was strange, but later we found this was also the case near the zócalo. In Oaxaca there are street markets and food carts everywhere around the zócalo. We wondered if this was because of some sort of city ordinance in order to get tourists to spend more money in sit down restaurants. Anyway, we googled the nearest public market, which wasn’t that close to us, and walked there to buy fruit. When we got within 3-4 blocks of the market we started encountering the street food carts and outdoor fruit and vegetable stands that we were used to seeing. It always surprises us how the character of towns in Mexico completely changes near the markets. Here you see a concentrated mass of people out shopping for their daily food staples or eating at lower priced comedors and food stands. One of many old buildings damaged by the recent earthquake. 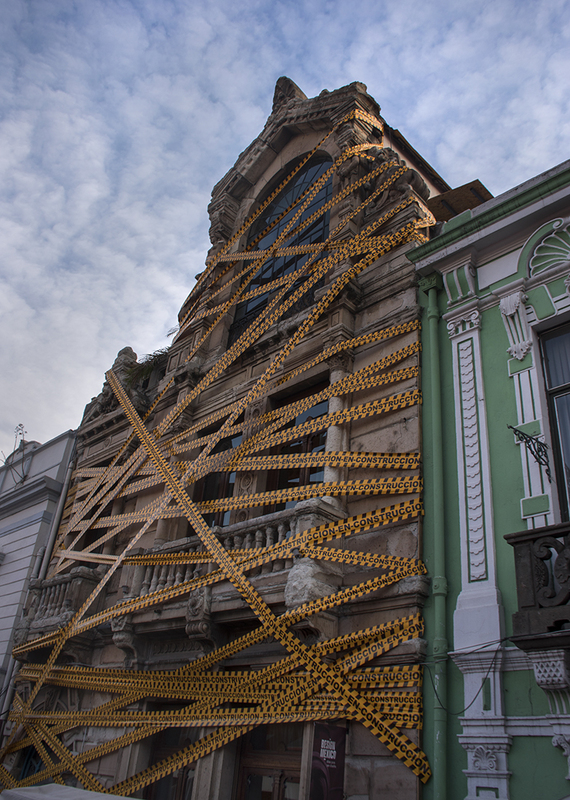 As we walked around the city we saw many landmark buildings braced with scaffolding and the sidewalks cordoned off, clear evidence of the significant damage caused by the magnitude 7.1 earthquake which had occurred only six months ago. Its epicenter was just 34 miles south of the city. In a strange coincidence, the 2017 earthquake occurred on the same day as the 1985 magnitude 8.0 quake which killed 10,000 people in Mexico. In remembrance of that quake, Puebla had participated in a national earthquake drill at 11am, just two hours before the new quake. Another damaged building waiting for repair. One of the highlights of our visit to Puebla was the Museo Amparo, which housed a rather odd combination of exhibits. The permanent exhibits include a large collection of art works spanning all of Mexico’s history from 2500 BC to present day, plus a re-creation of a wealthy colonial era home with period furniture and art works. 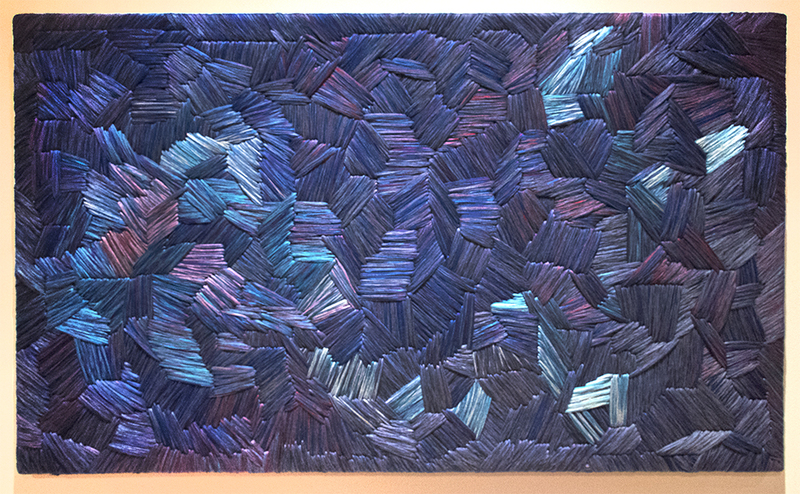 The temporary exhibits included an amazing collection of textile art, featuring works by U.S. artist Sheila Hicks, but also many others, and an exhibit of Yoshua Okón, titled “Colateral”, which explores the political consequences of actions and decisions, the way they branch out and spread, and especially their unnoticed consequences. The Okón exhibit was a series of rooms, most with videos playing, each room exploring a particular topic. Several of these themes targeted the negative influence of U.S. politics and modern culture on Mexico and the world, including fast food gluttony and U.S. border policies. It wasn’t easy for me to watch, particulary in the era of Donald Trump, which provided extra validation of his message. 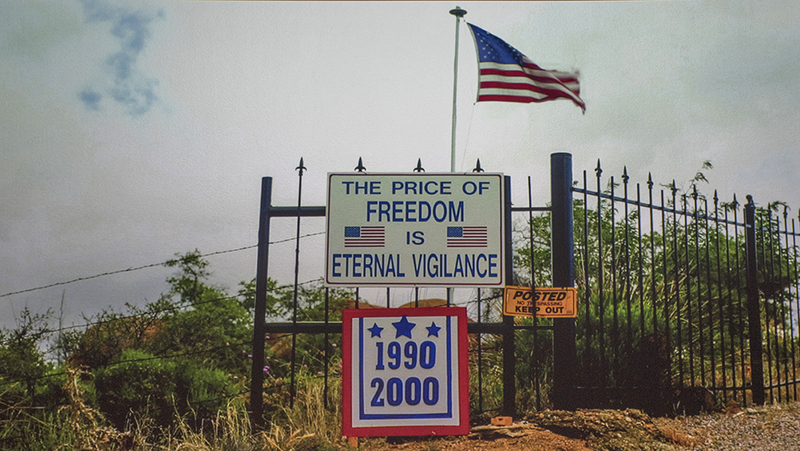 Screenshot from Okón video about American border paranoia. 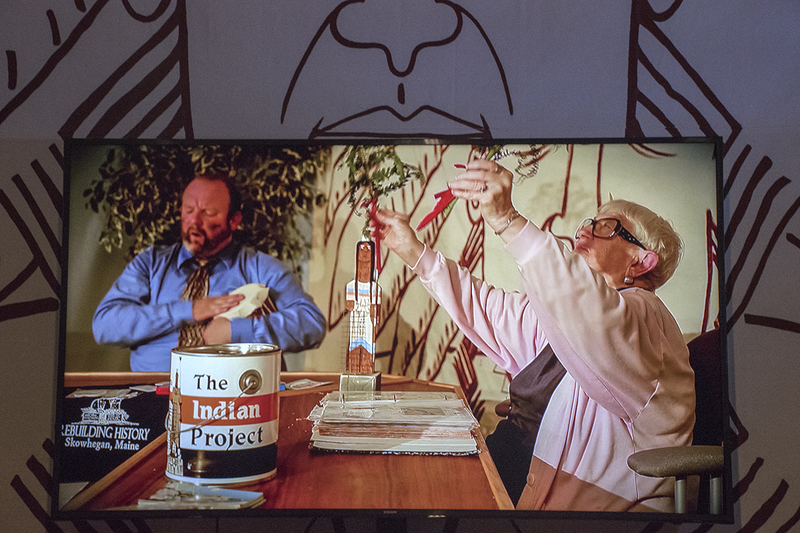 One video of Okón‘s that I particularly enjoyed was a Native American Trance Ceremony ineffectually performed by two white citizens of Skowhegan, Maine. The native population was massacred or driven from the area during the 4th Anglo-Abenaki War in the 1720s, but in the 1800s the town decided to embrace its Native American roots and changed the name of the town from Milburn to Skowhegan. They commissioned an 80 foot tall statue of a Native American chief which they bill as “the tallest Indian in the World”. Okón doesn’t need to try very hard to highlight the hypocrisy of the this situation, but the video is like something Christopher Guest would have done as a parody, except the people in the video are serious. Citizens of Skowhagen performing their own version of the Native American Trance Ceremony. A creation from the Textile Art exhibit at the Amparo Museum. 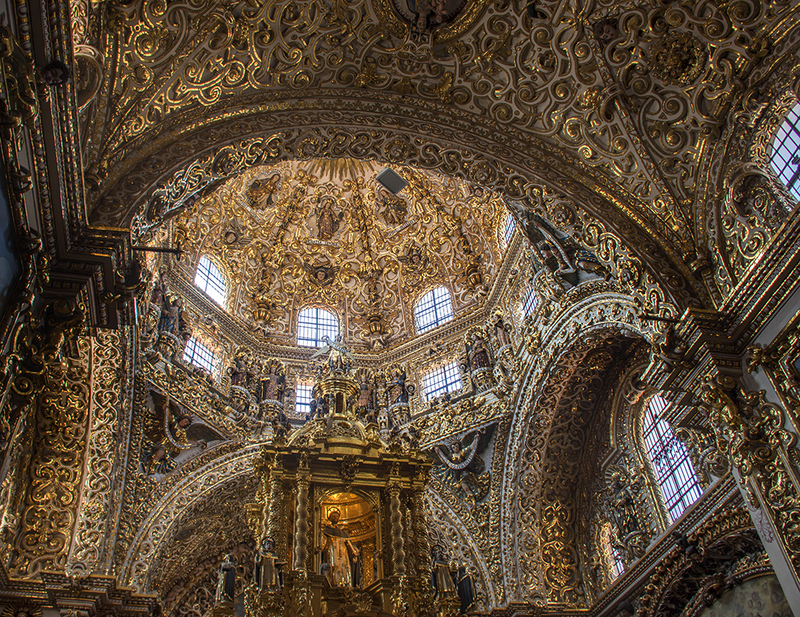 Our church visits included the Cathedral of Puebla and the Capilla del Rosario, a stunning baroque gilded creation which reminded me of a smaller version the Church of Santo Domingo in Oaxaca. I listened in on a tour which was being conducted in Spanish and learned that the architect of the chapel was indeed the same person who had designed Santo Domingo. Equally impressive was the Cathedral Basilica de Puebla, right next to the zócalo, not as ornate as the chapel but huge and imposing inside with amazing decorations. A large central section was roped off and you could see that the dome high above it was damaged, almost certainly from the earthquake. The altar of the Cathedral in Puebla. Domed ceiling of the Capilla del Rosario. 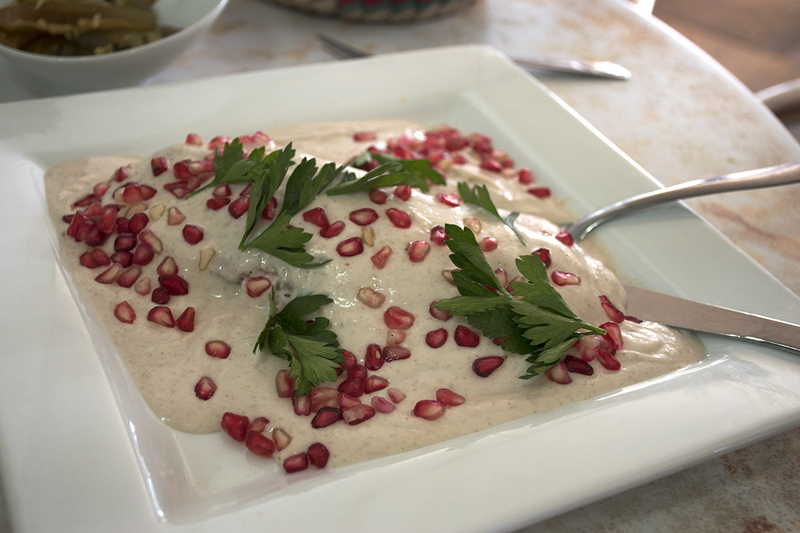 Ger was reading about the origins of mole and came across another dish that Puebla is famous for, Chile en Nogada. Like mole, this dish was supposedly created to impress a visiting person of importance, in this case the future emperor, Augustín de Iturbide. The dish is made from poblano chiles filled with a mixture of ground meat, aromatics, fruits and spices, topped with a white walnut-based cream sauce, called “nogada”, red pomegranate seeds, and green cilantro, giving it the three colors of the Mexican flag. Ger had decided that she wanted to try this dish, but most of the restaurants that served it did so only during the summer when pomegranates were in season. One day we found a restaurant named Tortas Meche, on the zócalo, which advertised the dish on a permanent sign under their name. It turned out they served it year round and so the next day we stopped in for lunch and shared a cemita and a plate of Chile en Nogada. It was very good and had a taste combination unlike anything we had encountered in Mexico thus far. Chile en Nogada, a famous Poblano dish. Some of our other culinary favorites during our stay in Puebla include Vittorio’s Italian restaurant on the zócalo which had really good pizza, Comál (also near the zócalo) which had really good cemitas and tacos arabe, Don Pastor which had a really good pastor and tocino alambre for 95 pesos. We ate twice at El Viejo Rosario restaurant. The first time we both had mole dishes which were very good and cheap. The next time we had pasta which was so-so. We had coffee at Tarlets coffee across from the Cathedral after we discovered they served Illy coffee from Italy, one of Ger’s favorites. It was excellent. Overall, we had a wonderful week in Puebla and would gladly return there for a longer visit. Ger may prefer Oaxaca, but I think if I had to choose a place to live for an extended time in Mexico, Puebla would be my choice so far.